Made in the USA of 100% Spun Polyester. Dry clean only. Bedskirt is offered in your choice of 15", 18" or 21" drop. Measurement is from top edge of box spring to floor. 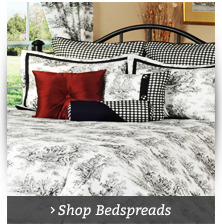 * Twin 3 piece Set includes Comforter 72" x 96", one standard pillow sham, and one bed skirt. * Twin 7 piece includes includes Comforter 72" x 96", one standard pillow sham, one bed skirt, one euro sham and three decorative pillows. 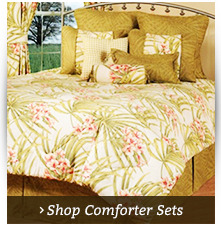 * Full 4 piece Comforter set includes Comforter 86" x 96", two standard size pillow shams, and one bed skirt. * Full 9 piece set includes Comforter 86" x 96", two standard pillow sham, one bed skirt, two euro shams and three decorative pillows. * Queen 4 piece set includes Comforter 92" x 96", two standard size pillow shams, and one bed skirt. * Queen 9 piece set includes Comforter 92" x 96", two standard size pillow shams, one bed skirt, two euro shams and three decorative pillows. 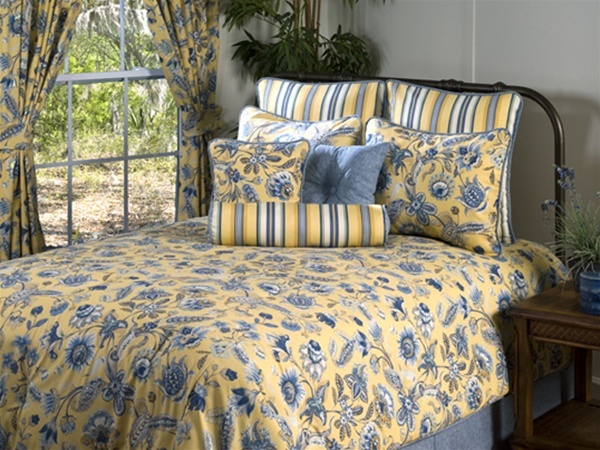 * King 4 Piece set includes one comforter 110" x 96", two King size pillow shams, and one bed skirt. * King 10 Piece set includes one comforter 110" x 96", two King size pillow shams, one bed skirt, three Euro shams and three decorative pillows. * California King 4 piece set includes Comforter 110 x 96, two king pillow shams, and one bed skirt. * California King 10 piece set includes Comforter 110 x 96, two king pillow shams, one bed skirt, three Euro shams, and 3 decorative pillows. Add a French accent to your home with our delightful Victor Mill Cherborg bedding and curtains collection from The Curtain Shop. A charming floral pattern in cornflower blue, soft yellow and white reflect the lovely landscapes of Cherbourg in coastal France. Bed skirts and pillows in solid colors and stripes add a sophisticated touch to comforter sets available in twin, queen, king and California King sizes. For a truly unique look, add one of more of our designer toss pillows to complement your Cherborg comforter. Choose from three-piece sets, seven-piece or 10-piece comforter sets in an American-designed Cherborg pattern by Victor Mill. 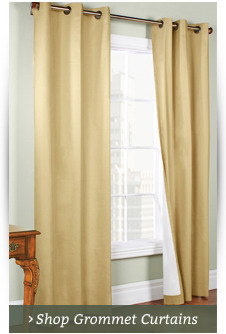 Also shop our Cherborg pattern curtains, valances and shower curtains. 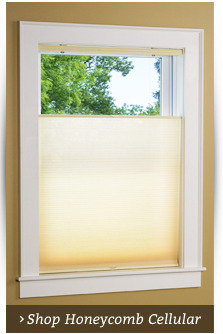 See our curtain sizing tips to help you find the right size and style in window treatments. We have been helping make homes beautiful at affordable prices since 1953. Enjoy our price-match guarantee on qualifying purchases. Join our email list to learn first about sales and new finds in home fashions.